The 2016 first-round pick has lived up to the Draft hype -- he enters the 2019 season as not only the top Houston prospect but also the No. 1 pitching prospect in baseball. Whitley, who only turned 21 this past September, has racked up 203 strikeouts and walked just 51 in 137 1/3 innings in the Minors since his debut four years ago. The 6-foot-7 right-hander features a fastball that can reach 98 mph to offset a curveball, slider and changeup. He was sidelined last season with a 50-game suspension and a few injuries, appearing in just eight games for Double-A Corpus Christi. In the Texas League, Whitley totaled 34 strikeouts and 11 walks, allowing two home runs and 15 hits in 26 1/3 innings. He posted similar numbers in the Arizona Fall League, recording 36 strikeouts and seven walks in six starts over 26 frames with Scottsdale. "Forrest features plus stuff across the board," said Pete Putila, the Astros' director of player development. "His five-pitch mix includes a 95-plus mph four-seam fastball, a hammer curveball, deceptive changeup and two cutter hybrids that he refers to as his 'up-cutter' and 'down-cutter.' After his fastball, it's difficult to rank his pitches because they're all plus, but his changeup has been his biggest swing and miss weapon. He is very focused on improving his craft day to day and it shows." Astros fans are hoping Whitley, a San Antonio native, will reach the Majors sometime this summer. Toro, a non-roster invitee to Spring Training this year, will likely make his Triple-A debut next month after hitting .247 with 16 homers and 78 RBIs across two levels in 2018. The 22-year-old infielder set career highs in both home runs and RBIs last season and continued to improve defensively at third. He enters the year as Houston's No. 23 prospect, a position that likely was aided by a strong performance in the AFL, where he ranked third in on-base percentage (.463), slugging (.561) and OPS (1.023). "Abraham Toro continues to hit at each level, including the Arizona Fall League, where he ranked third in OPS at just 21-years-old," Putila said. "Defensively, he has improved at third to become a plus defender there." The 20-year-old Arauz signed with the Phillies out of Panama in 2014 and came to Houston along with Ken Giles in the deal that sent 2013 No. 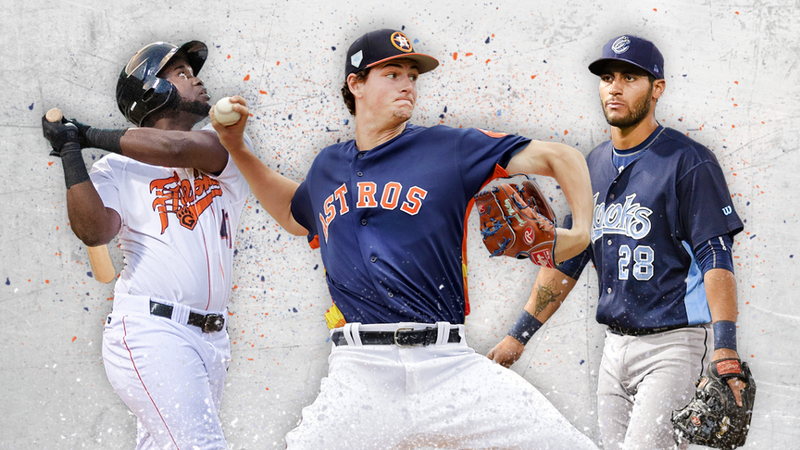 1 overall Draft pick Mark Appel and four others to Philadelphia in December 2015. Appel has since retired and Arauz, who won't turn 21 until August, enters the year as Houston's No. 25 prospect. It'll be an important season for the switch-hitting infielder after an up-and-down 2018 campaign that saw him hit .299 with a career-best .863 OPS in 54 games at Class A Quad Cities before batting just .167 with a career-worst .511 OPS in his final 71 games with Class A Advanced Buies Creek. He went 0-for-2 with a walk and a stolen base in three plate appearances across four Spring Training games with Houston this month and will likely start the year back in the Carolina League, this time with Fayetteville, the Astros' new affiliate there. His first half will set the tone for his confidence and continued progress in the Houston system. Kyle Tucker would be an obvious choice here -- Astros fans already got a look at him last season when the 21-year-old appeared in 28 games -- but we'll focus on Alvarez, a 21-year-old on the cusp of reaching The Show. Alvarez, MLB.com's No. 44 overall prospect, hit .293 with 20 homers, 74 RBIs and 21 doubles last season between Corpus Christi and Triple-A Fresno. The 6-foot-5 Cuban outfielder was a Futures Game All-Star the past two seasons and went 12-for-40 (.300) with three doubles and six walks in 19 Grapefruit League games this spring. "Yordan has shown this Spring Training that at just 21, his bat is ready for the show," Putila sad. "He is a pure hitter who has raw power that ranks with the best of them. He continues to work defensively at left and first base and is certainly in the discussion for 2019." How much louder can you be than Straw, an outfielder who stole so many bases in his first full season that he ran all the way to the Majors? Straw, a 24-year-old, appeared in nine games with Houston last year, going 3-for-9 with a homer and a pair of thefts. He swiped 35 bases at Double-A before taking 35 more with Fresno. His 70 total steals led the Minor Leagues, and that achievement comes after he hit .358 to lead MiLB in batting in 2016. His 150 hits last season were tops among Astros Minor Leaguers, too. The downside with Straw is he has very little power -- he had one homer in 516 Minor League at-bats before launching a 395-foot shot last September with Houston -- and he saw his average dip from .327 in the Texas League to .257 in the PCL over roughly the same amount of playing time in 2018. The 2015 12th-rounder has three homers in four Minor League seasons and tends to produce more opposite-field ground balls than deep flies. His speed, though, makes him tough to throw out, even on grounders. He's been 86-percent successful in stolen base attempts the last two years and showed off his speed in the outfield earlier this Spring when he robbed Tim Tebow with a diving catch on Feb. 24. Straw was in the mix to stir up the Astros' outfield corps this spring but was reassigned to Minor League camp on March 19 and figures to start the year at Triple-A Round Rock. An injury could open the door to Straw later this season, especially considering the Astros only had one player (Jose Altuve) steal more than 10 bases last year. More to keep an eye one: Freudis Nova, a shortstop with a big arm, is likely ticketed for his full-season debut with Quad Cities. The Astros' No. 7 prospect spent his first two seasons at the Rookie level and hit .308/.331/.466 last season with the GCL Astros, going 45-for-146 with six homers, 28 RBIs and nine stolen bases in 41 games. A promotion will be an anticipated milestone for an infielder the Astros have already invested $1.2 million in. ... Putila thinks Reymin Guduan, a 27-year-old lefty reliever, could climb out of Triple-A for good in 2019. "Guduan has always had a plus fastball and filthy breaking ball as a lefty, but this Spring Training he has shown the ability to put it all together. [It] will be a big year for him to show that he can be a dominant lefty option out of the pen." ... Righty Nick Hernandez will make his return from Tommy John surgery after missing all of 2018. The 2016 eighth-rounder struck out 70 and walked 26 in 58 2/3 innings out of the 'pen in 2017. "Hernandez features a 92-93 mph four-seam fastball with a plus changeup and slider," Putila noted. "He has remained focused through his rehab and is ready to get back on track." ... J.B. Bukauskas, the Astros' first-round pick out of UNC in 2017, got the grand tour of the Houston system last year, putting on five different uniforms while going 4-2 with a 2.14 ERA and 71 strikeouts in 59 frames over 14 starts. The 22-year-old kicks off 2019 as the Astros' No. 6 prospect.